First I want to say that, from the moment I met both of you, I knew you were special. Not in the way that the world saw you, but in your character, your smile, and your ability to light up a room. You are my best friends and my inspiration. And from the moment that Gabe went to be with Jesus, you were my protection. You gave the best hugs, and you always listened. You knew the same hurt, and we took the road together. I remember when we were young (I was around eight and you were both five), I asked our older brother Gabe to build me a bus. I remember getting chuckles from mom, dad, and Gabe, but I was serious. They all asked me, “For what?”. It was for you. I wanted to have a bus to start a school that was designed for you. As I grew older, I stuck with this dream. In seventh grade, I wrote a paper expressing what I wanted to be when I was older—a special needs teacher, I wrote. I saw your passions, your struggles, your happiness, and I knew that being smothered in your presence was my biggest dream. I kept this dream into my college years and I studied to become a special needs teacher. But about two years in, I got tired. The concepts I learned, the classrooms I saw, that was not where you were. I stopped pursuing that dream. In the third year, God put me on a new road—business. I could see how God had helped mom and dad start Downsize Farm. Under His hand, they made a place for you. A place where you would have opportunity, friendships, challenges, and adventures. I remember reading your IEPs once. Eric, yours said that you wanted to be a trash-man. Levi, yours was to work at Walmart. Is that what you want to be? If that is your dream then I want you to go for it! But if not, I am making something for you—a coffee shop. (I know you don’t like coffee, but we will have hot chocolate too!) I am designing a place where you can not only work, but be the strongest, and coolest employees a business has ever seen. I want to teach you what I have learned. I want you to be able to use all of your abilities to the fullest, and be able to show them off to every person that walks into our building. Most importantly, it is my eternal dream to create and fulfill the dreams that you have. On May 21st I will open a coffeehouse. I know you think coffee is gross, but if you join this road with me I will show you something. Every bean in that coffee has a purpose. Some beans are big, some beans are small. Some are dark, some are light—but they all create a beautiful mixture to jumpstart the day. On this Earth you could say we are all like little beans. We run around, doing daily tasks, and fulfilling our flavored lives. But God put every one of us here to do something special. I hope that by fulfilling this dream, I am following God’s vision by helping you create your own dreams. Will you, my red and blue power rangers, take on this mission with me? Bobbi, that is beautiful. You are a great inspiration for your brothers as well as others in this world. You will go far. Thank you soo much! I’m just trying to keep my head straight on the vision. Prayer that this is for God and for my brothers. My name is Erica VandenHouten. I am also a Christian with a brother who has Down Syndrome. I was so moved by this. Where will your coffee shop be? I’ll be praying! Thank you so much! Your prayers mean so a lot!! It will be in Urbana, Oh. Bobbi, my best wishes for you. Our Kelly is almost 18 and adored by her older siblings. Keep going strong!!! I just love your brothers! I miss cutting their hair but did see them yesterday when they were working . Eric and Levi are such genuine and hard working. Where in urbana will it be cause i will be a frequent customer love me some coffee 😉 good luck and best wishes on your adventure !! Bobbi, this made me tear up! You (and your family) have been such a blessing to so many! I look forward to seeing what God has for you and your dream. I can’t wait to walk through the door and enjoy some coffee and more! ❤ ya! , I told him I like that song and he said “so do I Michael” that just warmed my heart. I saw this post on Cathy Pullin’s Facebook page and had to read. I remember when you first came into my preschool classroom at Lawnview all those years ago. Even as a three and four year-old, you had a sense of purpose and direction in your life. Your amazing parents helped in that area, I’m sure. It’s funny how life twists and turns. You think you have it figured out one minute and then there is a bend in the road. The beauty of getting older (for me) is that I can look back at some of those twists, turns, bends and crossroads and realize that they are all part of God’s plan in my life. Bobbi! I grew up there! Ill be traveling there in July! Can’t wait to stop by and see it! Ill continue to pray for you and what god has manifested in your life! Bobbi this is fantastic and beautifully written. We are so lucky to have you at the Berg! Bobbi, I remember when you and your brothers came with Alycia to youth group. I remember your brothers’ joy and the maturity and compassion you had even then. We will definitely come to visit and support you when you open. Thank you for allowing God to work through your life; blessings will come from this! A friend of mine posted this on their Facebook page and I just had to read. I am very encouraged to see that there are people like you in this world. I am a current student over at Mount Vernon Nazarene University with a physical disability. Its called arthrogryposis multiplex congenita (AMC). I would love to continue to hear more of this journey and try to help in anyway I can. Thank you for your support in the world of disabilities! Hi Bobbi, this is an awesome thing you’re doing! I don’t know if you remember me, but Charley, Sarah, and I went to church with you at Jenkins Chapel. I will plan on visiting Urbana on May 21st. This is awesome Bobbi, not going to lie made me tear up, but your truly are wonderful and so are those sweet boys. I have always had this love and compassion that society has labeled “not normal.” I look around at the actions of the so called normal people and they sicken me. I look at these special children of God and I see all the things and the gifts my spirit wants me to rise up to become with the power of the holy spirit. I’m from Springfield and hope to have some coffee at your shop. Send along an address and the name of the place. God bless you. 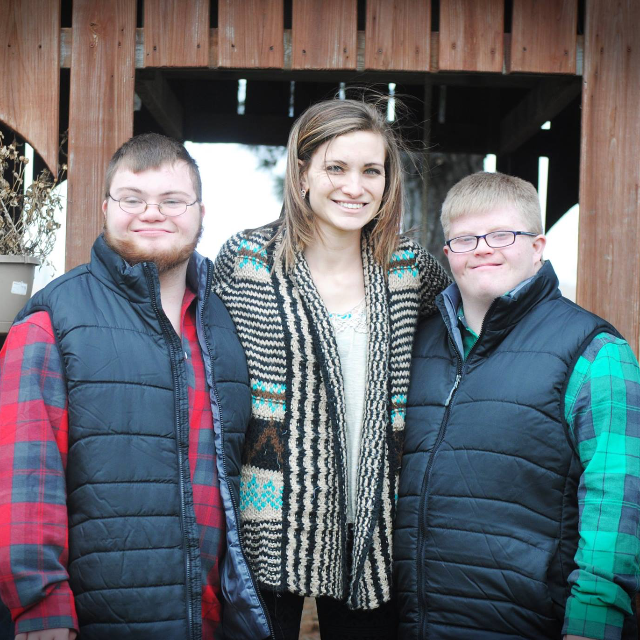 I had Eric and Levi in my preschool classroom at Lawnview Child and Family Center and I so enjoyed reading this wonderful story about you, Bobbi, and your love for these two very special brothers. You are a blessing to them and also to your parents. After taking some time away from the classroom, I have just returned to a multi-handicapped classroom where I have the privilege to work with many awesome young men and women like Eric and Levi. Wishing you all the very best in this endeavor and as a coffee drinker, I will be sure to stop in and check out this new journey in your life. Hoping you will continue to write this story!! This is a special note to our wonderful daughter. Bobbi, I know these days are a challenge to you while you finish your college experience, and as always you push yourself to finish with excellence. I want you to know how proud we are of you and all you have accomplished. We are really looking forward to your dream and all that it will hold for you and your brothers. While working with all of our special clients life can be challenging at times, but we know you have the tenacity and grace to be a success. You are truly God chosen and God blessed. LETS DO THIS!!! I think what you are doing is awesome. The world needs to hear your story.